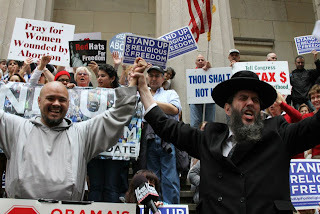 Sen. Joe Liberman Betrayer of Orthodox Judaism | RabbiLevin.com - Fighting for Morality! Sen. Lieberman's craven support of all things homosexual reaches a new low as he jumps to head of the class to sponsor federal legislation providing full marriage benefits to all partners of homosexual federal workers. Rabbi Levin, you're so ignorant, backward, simplistic and guided by fear (NO, NOT BY TORAH) that its frightening. You're hiding behind God and Torah to justify you bigotry is the real Hilul HaShem!